The proprietor of Rick’s Cafe Americain was sure the ‘problems of three little people don’t amount to a hill of beans in this crazy world’, but they did. And as time went by, they amounted to much more – a film often described as ‘the best Hollywood movie of all time.’Here we go behind-the-scenes of this lachrymose romantic drama set in wartime French Morocco 72 years ago. So grab a Casablanca Cocktail* or Vichy Sling*, fill your tear-ducts and celebrate what is still an iconic mix of foreign affairs, ‘fight for love and glory’ intrigue and ‘we’ll always have Paris’ nostalgia. Casablanca had its world premier in New York City on November 26, 1942. Released nationally on January 23, 1943, it won the Best Picture Academy Award that year. Other Oscar winners were director Michael Curtiz and screenwriters Howard Koch, Julius and Philip Epstein. The Writers’ Guild of America rated their screenplay the ‘best ever written’ on April 7, 2006. The film’s leading actors, however, missed out. While Humphrey Bogart was nominated for Best Actor for his first romantic leading role as Rick Blaine, he lost to Paul Lukas in another Warner release, Watch on the Rhine. Best Supporting Actor nominee Claude Rains lost to Charles Coburn for George Stevens’ comedy The More the Merrier. Ingrid Bergman – also shortlisted, but for Sam Wood’s For Whom the Bell Tolls — lost the Best Actress Oscar to Jennifer Jones for The Song of Bernadette. Casablanca — that’s Bogey and Bergman (above) chatting on the set — was not expected it to be a big hit, even by the cast. It was just one of the many films produced by Hollywood every year. Box office earnings were only US$3.7 million, despite a rushed release to surf on publicity from the Allied invasion of North Africa that began two weeks earlier on November 8, 1942. The film script began life as a pro-French Resistance stage-play, Everybody comes to Rick’s. Written by Murray Burnett and Joan Alison in 1940, it was bought by Warner Brothers for a record figure of US$20,000. According to his obituary in the New York Times on September 29, 1997, Burnett – then a 27-year-old English teacher — travelled to German-occupied Vienna with wife, Frances, in the summer of 1938 to help Jewish relatives smuggle out money. They were shocked by what they saw in Austria, a country just annexed by the Third Reich’s Anschluss Österreichs. Miffed by the lack of recognition, they tried to regain control of intellectual property from Warner Brothers. 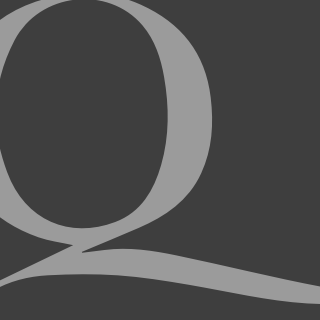 In 1986, however, the New York Court of Appeals ruled they had signed away their rights. The studio eventually paid each US$100,000 and allowed them to produce the original play. Re-titled Rick’s Bar Casablanca, it opened at London’s Whitehall Theatre on May 11, 1991, but ran for only four weeks. Bergman’s ‘Norwegian’ Ilsa Lund was the Swedish actress’s most enduring role. Ilsa’s on-screen beau, Victor Laszlo, was played by Paul Henreid. An Austrian actor who came to the USA in 1935, he did not hit it off with his co-stars, describing Bogart as ‘a mediocre actor’. If anyone needed a drink on-set, it was Bergman. Not only did she find Henreid ‘a prima donna’, there was another problem; as 93-year-old Howard Koch explained in a 1995 interview with Eliot Stein and Frank Miller. Koch: When we began, we didn’t have a finished script. Ingrid Bergman came to me and said, “Which man should I love more…?” I replied: “I don’t know. Play them both evenly.” You see we didn’t have an ending, so we didn’t know what was going to happen. 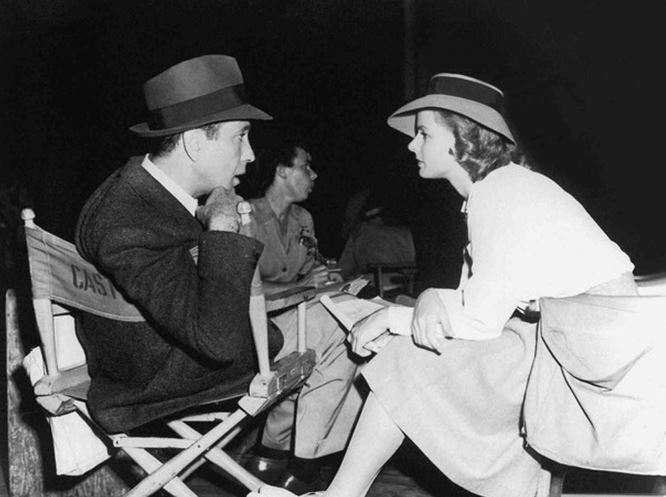 Stein: What were Bogart and Bergman like as ordinary people? Koch: Bergman was more tense and nervous than the American actors she was playing opposite. She wasn’t used to playing without a finished script. The ending was in the air until the very end. I was working every day on the set. We never really had the ending for sure. We thought of many possibilities and finally decided on the one in the film. That has proven to be the ending that the audience accepts! Miller: There was a scene planned, after the ending, that would have shown Rick and Renault on an Allied ship just prior to the [Operation Torch] landing at Casablanca, but plans to shoot it were scrapped when the marketing department realized they had to get the film out fast to capitalize on the liberation of North Africa. There were lots of problems on the set. But the major issue with Ingrid Bergman was her uncertainty about how the film would end. Curtiz kept telling her to play it “in-between,” which is what she did. And it made the film work better than if she’d known the ending. Captain Louis Renault was played by English actor Claude Rains, who had worked with Curtiz on The Adventures of Robin Hood. He later appeared in Alfred Hitchcock’s 1946 film, Notorious, with Bergman and Cary Grant, a spy-thriller notorious for a two-and-a-half minute osculation. The large number of European exiles who played minor roles contributed much to Casablanca’s emotional impact. A witness to the duel-of-the-anthems sequence – La Marseillaise versus Die Wacht am Rhein (Watch on the Rhine) — saw many actors crying real tears and “realized that they were all real refugees”. For Aljean Harmetz, they brought “an understanding and a desperation that could never have come from Central Casting”. As for the Germans among them, they were treated as enemy aliens and had to keep a curfew. Even though many were Jewish, they were often cast as Nazis in USA war films. As mentioned earlier, just two weeks before the film’s release, Allied (predominantly American) Operation Torch forces took control of the real Casablanca – the principal Vichy French Atlantic naval base – after several days of fighting. A cruiser, six destroyers, and six submarines were destroyed by naval gunfire and aircraft in the Battle of Casablanca. General Dwight D. Eisenhower, the operational commander, may well have celebrated the quick victory with a Prairie Oyster* at HQ or a local equivalent of Rick’s Cafe Americain, perhaps with Major-General George – “say what you mean and mean what you say” – Patton. Our engagements having been fulfilled and the bloody battle having become useless, the order is given to all land-sea and air forces in North Africa to cease their fight against America and her Allies and to observe the strictest neutrality. The ceasefire allowed Operation Torch to complete this part of its mission without further opposition. Darlan later signed an armistice and folded his Vichy forces into the Free French military. But he never gained the latter’s trust. On Christmas Eve, 1942, he was assassinated by Bonnier de la Chapelle, a Charles de Gaulle supporter apparently training to be a British agent. They were not in the Casablanca script. But just hours after the film’s New York premier, the actions of a group of naval officers in Toulon – the French fleet’s Mediterranean home port – not only increased US box-office sales but also earned them at least a Corpse Reviver*or three. 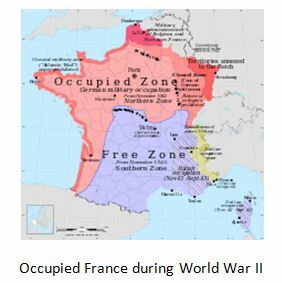 Operation Torch forced Adolf Hitler to activate Case Anton, to occupy Vichy France – the so-called ‘Free Zone’ in the attached map – and to reinforce German forces in North Africa. Operation Lila, part of this operation, began on November 19 with the objective of capturing the French fleet intact. According to one account, German SS entered Toulon at 04:00 on November 27, meeting little resistance. At 04:30 they stormed Fort Lamalgue and arrested Admiral Marquis. They failed, however, to prevent Contre-Admiral Robin, his chief of staff, from contacting the Mourillon arsenal, which managed to transmit a scuttle-order to Admiral Laborde on the flagship Strasbourg. Laborde gave orders to prepare for scuttling, and to fire on any ‘unauthorised personnel’ approaching the vessels. The French destroyed 77 vessels, including 3 battleships, 7 cruisers, 15 destroyers, 13 torpedo boats, 6 sloops, 12 submarines, 9 patrol boats, 19 auxiliary ships, 1 school ship, 28 tugs and 4 cranes. Thirty-nine small ships were captured, most of them sabotaged and disarmed. Some of the major ships were ablaze for several days, and oil polluted the harbour so badly that it was two years before it was possible to swim there. When the Germans started machine-gunning French submarines, several defected to North Africa: Casabianca and Marsouin reached Algiers, Glorieux went to Oran, and Iris Barcelona. However, only one surface ship, Leonor Fresnel, managed to escape and reach Algiers – much to the chagrin of Charles de Gaulle and Winston Churchill. It had been a busy — and momentous — morning. With the French fleet gone, the Vichy regime lost all legitimacy and power. The rest, as they say, is history. Casablanca Cocktail – Dry champagne, 25ml brandy, 50ml lachrymal drops, 1 white sugar cube, Angostura bitters. Douse sugar cube in Angostura bitters and place into a champagne flute. Add brandy, gently top up with brut champagne and finish off with a Here’s looking at you, kid toast. Panache is paramount. Never out of style. Vichy Sling – 50ml gin, 25ml lemon juice, sugar syrup, Cherry heering, slice of lemon, stemmed cherry. Pour the gin, lemon juice and a dash of sugar syrup into a cocktail shaker. Shake sharply, strain into a sling glass filled with crushed ice. Muddle mixture using spoon, add a float of Cherry Heering. Garnish with slice of lemon, a stemmed cherry. Serve with straws and toast Travail, Famille and Patrie. Prairie Oyster – 40ml cognac, 1 egg yolk, 1 bar-spoon malt vinegar, 2 dashes of Tabasco sauce, 1 bar-spoon Worcestershire sauce, salt and pepper. Place the egg yolk, unbroken, into a Margarita glass. Gently pour in rest of ingredients without breaking yolk. Drink it down in one and sing God Bless America. ‘Cease Fire” in Morocco and Algeria – Darlan orders surrender.’ London Daily Telegraph & Morning Post, November 12, 1942 (No 27,278).